English novelist, daughter of Henry Braddon, solicitor, of Skirdon Lodge, Cornwall, and sister of Sir Edward Braddon, prime minister of Tasmania, was born in London in 1837. She began at an early age to contribute to periodicals, and in 1861 produced her first novel, The Trail of the Serpent. In the same year appeared Garibaldi, accompanied by Olivia, and other poems, chiefly narrative, a volume of extremely spirited verse, deserving more notice than it has received. 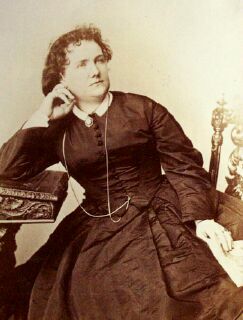 In 1862 her reputation as a novelist was made by a favorable review in The Times of Lady Audley's Secret. Aurora Floyd, a novel with a strong affinity to Madame Bovary, followed, and achieved equal success. Its immediate successors, Eleanor's Victory, John Marchmont's Legacy, Henry Dunbar, remain with her former works the best known of her novels, but all her numerous books have found a large and appreciative public. They give, indeed, the great body of readers of fiction exactly what they require; melodramatic in plot and character, conventional in their views of life, they are yet distinguished by constructive skill and opulence of invention. For a considerable time Braddon conducted Belgravia, In which several of her novels appeared. In 1874 she married John Maxwell, publisher, her son, W. B. Maxwell, afterwards becoming known as a clever novelist and newspaper correspondent.